Must be Link Summoned. (Quick Effect): You can Tribute this card; destroy all Spells and Traps your opponent controls. 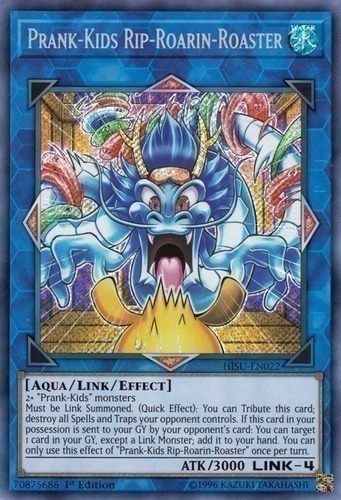 If this card in your possession is sent to your GY by your opponent's card: You can target 1 card in your GY, except a Link Monster; add it to your hand. You can only use this effect of "Prank-Kids Rip-Roarin-Roaster" once per turn.